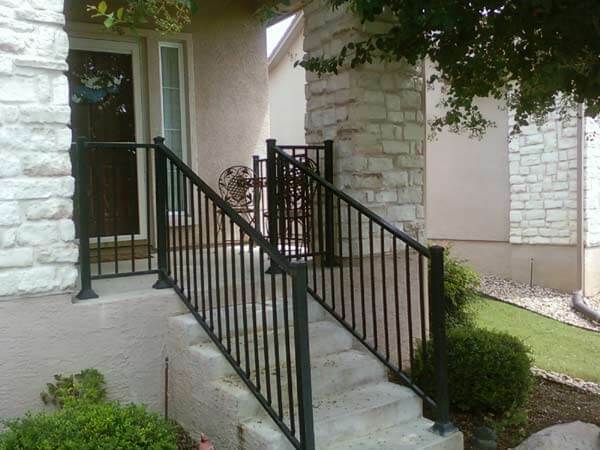 Apple Fence in Austin is not only equipped to help you build wrought iron fencing around your building. We also can help you maximize the safety of your home or business by providing iron stair railings for steps, porches, decks, or patios. Like it or not, you’re responsible for making sure that your home or business is as safe as possible. Do it in the best, most attractive way possible—with wrought iron fencing that is as stylish as it is safe. Ornamental fencing can be used to create railings and barriers in areas where you may be concerned about security and safety. Iron stair railings are the perfect material to choose for this type of job because of its strength and durability. Our iron material is difficult to damage, which is especially good for a high traffic surface like a handrail, and holds up well to weather and other environmental stresses. Your iron stair railing can be placed around an elevated porch or deck, to prevent falls, or placed alongside a stairway to offer additional support. When you call us, we can offer you both pre-made and custom iron fencing products. For most applications, pre-made products will be an affordable and completely feasible option. If you have a unique space, or need something specific, we can create a custom iron stair railing for you that will match your other wrought iron fencing. We are proud to offer our customers a wide selection of durable materials to create superior solutions for your iron stair railing needs. Call us and let us give you a free estimate or a tour of our showroom to show you how our years of local experience can help you find the solution you need at the price you want.